Apart from low energy usage costs, floor heating is still the safest, most comfortable and cost effective way to warm a room. No exposed elements or flames, no dangerous moving parts, no toxic fumes, odours or drafts – just a gentle, even heat, from the ground up. To warm an 18m² room, for example, you would have to spend R3.30 per hour on an electric bar heater, R3.30 per hour on an electric fan heater, and only R2.48 on a 1500w Warmup undercarpet heater pad. Heating a 24m² room would cost you R4.95 if you were heating the area with an electric oil fin heater, R7.25 per room if you were using a 3-setting gas heater, and only R3.30 if you were using a 2000w Warmup undercarpet heater pad. Heating a 30m² room would cost you R12.50 per hour if you were using a wood burning fireplace, R5.28 per hour if you were using an electric air conditioner and only R4.13 if you were using a 2500w Warmup undercarpet heater pad. Heating a room with Warmup is the most cost-efficient way to keep occupants warm. 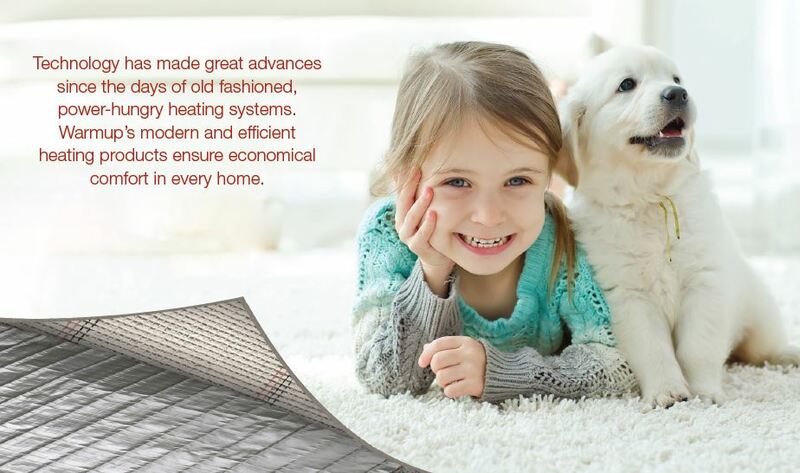 The quality foil heating pads, combined with intelligent thermostats and smart heating cables, makes this an ideal way to keep your interiors warm this winter. For more information, contact Warmup on +27 (11) 673 5063 or via www.warmup.co.za.